If you have received any portion of your salary in arrears or in advance, or you have received the family pension in arrears, you are allowed some tax relief under section 89(1) read along with Rule 21A. 1. What is relief under section 89(1)? To save you from any additional burden of tax due to delay in receiving income, the tax laws allow a relief under section 89(1). In simple words, you do not pay more taxes if there was a delay in payment to you and you were in a lower tax bracket for the year you received the money. Step 1: Calculate tax payable on the total income, including additional salary – in the year it is received. Arrears provided for will reflect in Part B of Form 16. Step 2: Calculate tax payable on the total income, excluding additional salary in the year it is received. You can get the amount of the additional salary (Arrears) from the arrear document given by your employer. Now you have to subtract the arrear from the total salary received (including the arrears), which can be taken from your Form 16. 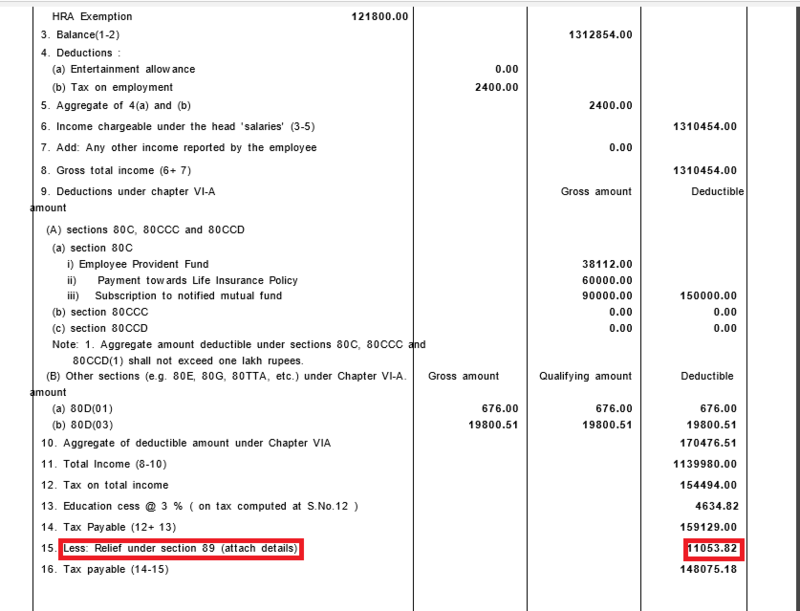 After knowing the amount after arrear, you need to calculate the tax over the same. Step 3: Calculate the difference between Step 1 and Step 2. Step 4: Calculate tax payable on the total income of the year to which the arrears relate, excluding arrears. Step 6: Calculate the difference between Step 4 and Step 5. 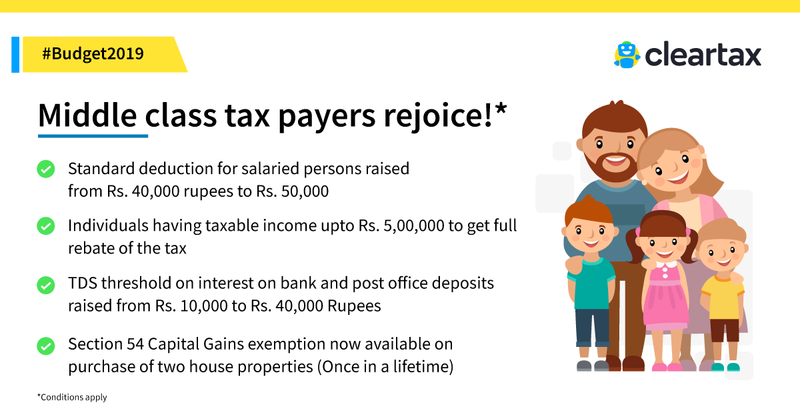 Step 7: Excess of amount at Step 3 over Step 6 is the tax relief that shall be allowed. If the amount in Step 6 is more than the amount in Step 3 no relief shall be allowed. Alternatively, you may follow the steps on the income tax website to calculate the tax the arrears. Once you have calculated this amount you can enter the values on ClearTax and proceed to file your return. To claim the benefits under section 89(1), filing of Form 10E is mandatory. This form can be filed online on the income tax e-filing portal. To access the form you must login to your account. Step 1: Login to https://incometaxindiaefiling.gov.in/ with your User ID and password along with the date of birth. 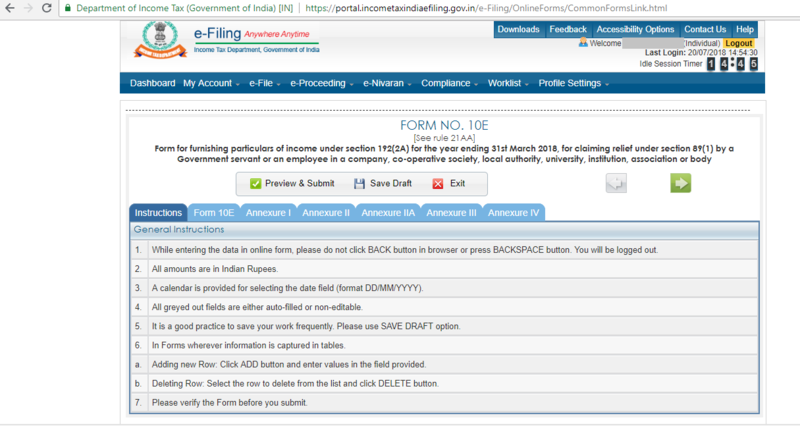 Step 2: After you have logged in, click on tab named ‘e-File’ and select ‘Income Tax Forms’. Step 3: The below screen shall appear. Enter the PAN and select Form 10E, the assessment year and the submission mode from the drop-down. Step 4: The below screen shall appear with instructions on how to file Form 10E and enter the details in blue tabs provided. Step 5: On completing the Form, click on ‘Preview and Submit’. From the financial year 2014-15 (assessment year 2015-16), the income tax department has made it mandatory to file Form 10E if you want to claim relief under section 89(1).